Bathrooms can be rooms that get overlooked in a house and they shouldn’t. These spaces are nearly always the first place we go to when we wake up and the last room we leave before we go to sleep, so they should make us feel great. I’m one of those “bath lovers” so I can really spend hours in my bathroom as its the place I actually go to to try to relax. Below are a few ways you can update your bathroom to give it a fresh finish. There isn’t a single room in your house which won’t benefit from housing a plant. Not only are they so varied and beautiful, they are also proven to help reduce stress and create a sense of well-being. Plants can also help to reduce noise and improve air quality! Ok I’ll stop singing plants’ praises, but now you know, you have no reason not to add some greenery to your bathroom! This is one of the fastest, most fun and easiest ways to update your bathroom. 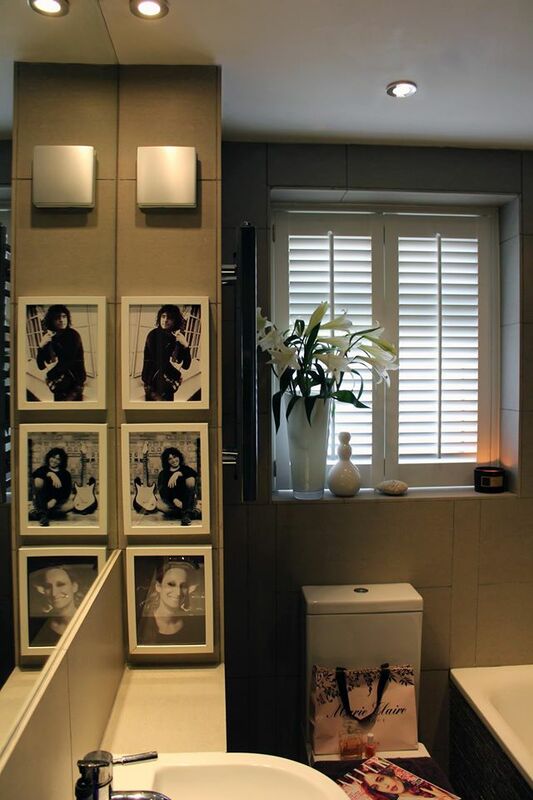 Bathrooms aren’t always filled with lots of natural light so choose plants which require low lighting to thrive. Humidity and temperate levels are also important as hot running water and lots of steam can cause these levels to increase, and some plants are not happy about this. 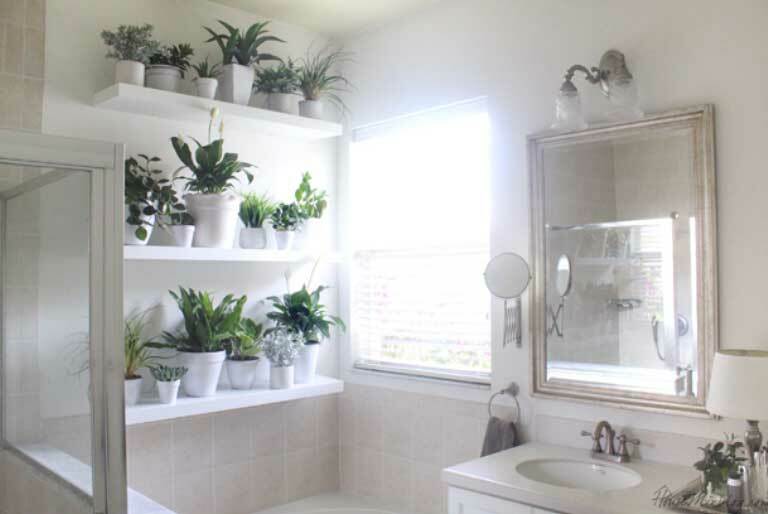 Most bathrooms aren’t huge in size either, so opt for plants which can sit on a shelves and windowsills, trail down walls and hang from the ceiling. My favourites are aloe vera, ivy and the cast iron plant, which lives up to its name. Not even I can kill this one! Art work is another way to update your bathroom. If you think your bathroom or downstairs toilet is too small for art work, it isn’t! Artwork comes in every form and size these days and you may be surprised at what works in this space. Seascapes and beaches are a great go to for bathroom art work but really anything can work. 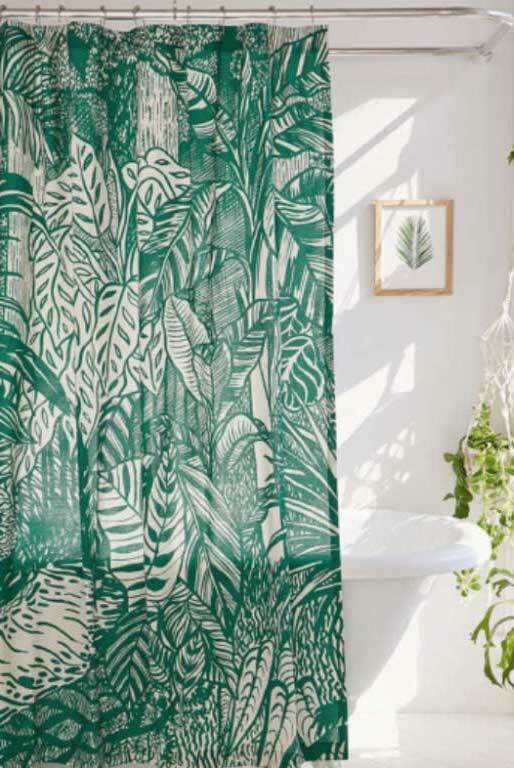 Nature is another art subject which sits well in a bathroom as it will help to bring the feeling of the outdoors in to your space. If you want a cosmopolitan feel printed typography and graphics are a fun way to freshen up the room. Refreshing your bathroom can be as easy as changing your shower curtain. Long gone are the days of plain white shower curtains which stick to your wet body whenever you try to move! The High street and lots of online retailers offer various colours patterns and designs which can be suited to any style. I would suggest opting for something fun and patterned or colourful to really add some life to your bathroom. The best thing about shower curtains too is that they can be changed easily and as soon as you think it has had its day. 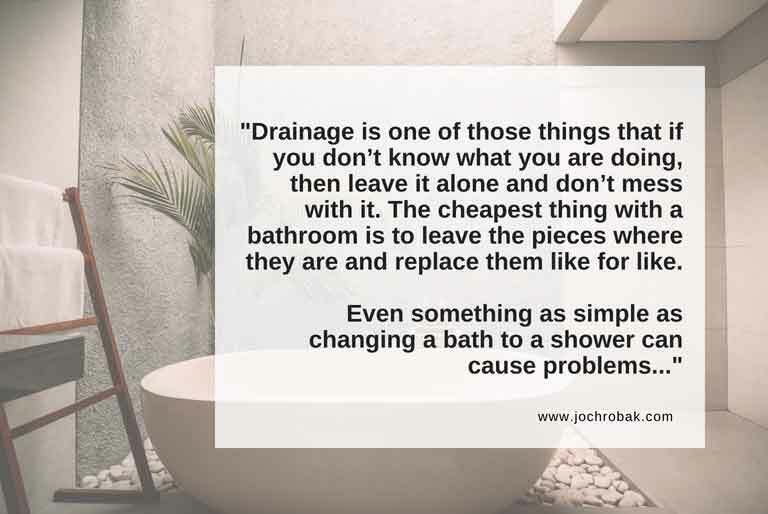 They are also great if you like to change your style from time to time and can be a cheap way to update your bathroom. Another option is to invest in updating your shower curtain to a glass screen. This option will help to modernise a bathroom space, possibly making it feel lighter and arguably even cleaner. Updating your towels is also a really easy way to freshen up your bathroom. 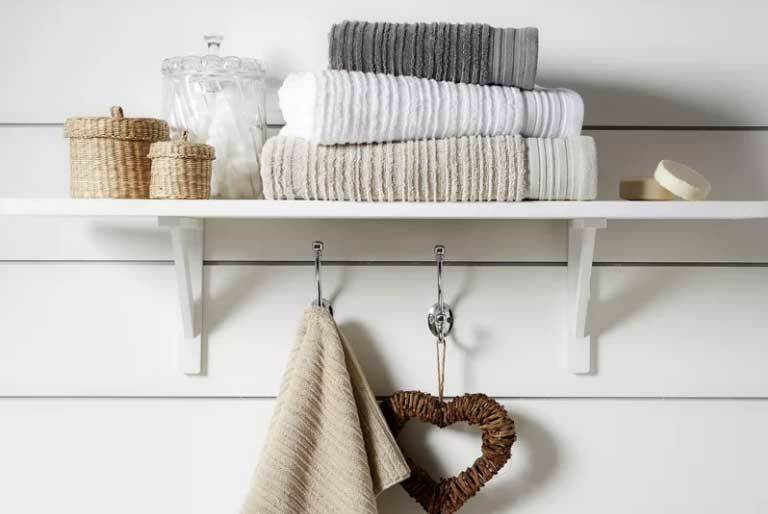 Adding luxurious towels in contrasting or complimentary colours will make the space look nicer, but importantly when you get out of the shower or dry your hands, they will feel nicer on your skin. There’s nothing better than placing your towel over the radiator before washing and then stepping into a warm fluffy towel! 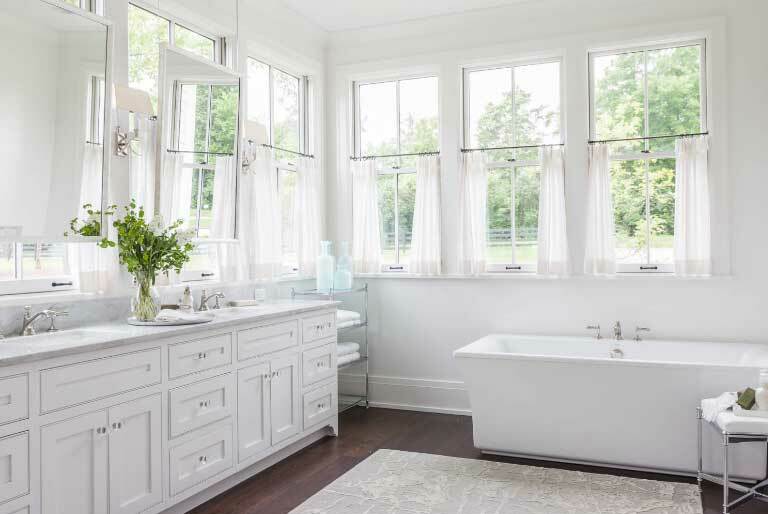 Updating your window furnishings is another great way to bring your bathroom to life. Blinds don’t have to be extortionate and colourful prints or designs will help to instantly uplift the room. As with choosing art work and shower curtains, you can have lots of fun with choosing patterns and colours for blinds. The designs are endless and there is a design out there to suit everyone. Having lived in small, shared, inner-city spaces for much of my 20’s, I found lots of ways of making my tiny rooms appear much bigger than they were and more importantly store all of my guitars and sporting equipment like snowboards, climbing gear and bikes out of the way for daily life. I remember my first room in London was less than 4m2 (13 square feet) and I loved living there so much. It was cosy, with a big window and I even had one of my super tall besties stay with me in that room. I remember he had to sleep diagonally across with his feet in the storage part of my undersized bed. I think I paid £60 a week to live there (ahh memories). It wasn’t until recently, when I was working with a client who loves large open spaces that I found he wasn’t convinced about something I had proposed, which led me having to make a digital 3D model to explain it. That is when I realised that this stuff can be quite hard to visualise, unless you have experimented with it or seen the results yourself. Use reflective surfaces (high gloss) and mirrors. When the surface is super reflective you can even use black as it reflects just like a mirror. Keep furniture low so that your eye casts over it and doesn’t obscure the room when looking around. Use sliding doors and pocket sliding doors. These will free up the space in front of cupboards, bathrooms and allow you to use the surface of the wall that the hinged door usually hides. Keep vertical and horizontal lines going full length or height and use built-in furniture to accentuate vertical or horizontal lines. Our eye naturally follows the lines and when the line stops with an obstruction, our eyes rest on it. In a smaller space, you want your eye to be able to move at least a little bit before it stops dead, so stand back and see what is stopping your eyes from flowing. Put a reflective surface or mirror on the wall opposite the window. This will bounce light around the room and acts like another light source. In one of my apartments, I built–in high gloss floor to ceiling cupboards with sliding doors on the wall opposite the window. It made the room feel huge and gave me a practical way of hiding all of my clothes. Want 5 more tips and some good habits for living in a small space too? To be honest, I could write a book about this topic because there really is so much to consider and so many different ways that you can approach your project that can save you money. The main thing I do believe though is that you need to have an end goal in mind and that is why the first 4 steps really help get you clear on what it is you want your end result to be. Unless you are clear on this, you will waver, and wavering WILL cost you money and you most probably won’t get the result you were aiming for (except by luck). Plan and layout your rooms. This is so easy these days! Just google kitchen layout or living room layout and get loads of ideas for your own space. Make a decision based on how you live and how you want to live in your newly designed space. This is a little harder unless you have some experience, but you will find out soon enough how much things cost in a home and where to source things. So the next step is to figure out where you are going to spend your money. This is usually where you will get disheartened. Seeing how much things ACTUALLY cost (seriously? £60 for 1 cushion!) – So now is the time to really know where you will spend your money. Spend time sourcing. One of the hardest things you will probably come across is where to find that amazing lamp you just need to complete your room and you can’t find it anywhere. The cool thing about being a designer is that people approach me to show me their products; so I don’t usually have to search for too long as I have good connections with the industry. 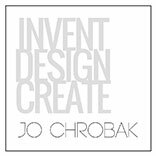 If you have any great resources you want to share, please email me or ask to collaborate on my Pinterest board. Get it to a stage where you can live with it, then you can spend the rest of your days tweaking it, evolving it, testing other fun ideas or changing things up for the season. It is an amaaaazing feeling when you have finished a room to perfection and it is just everything you had imaged it to be and more. Don’t stop until you get to this place. It IS worth it. One of my followers said she saved loads by buying expensive furniture second hand and repainting it to look new. Let me know how you saved money on your own project?